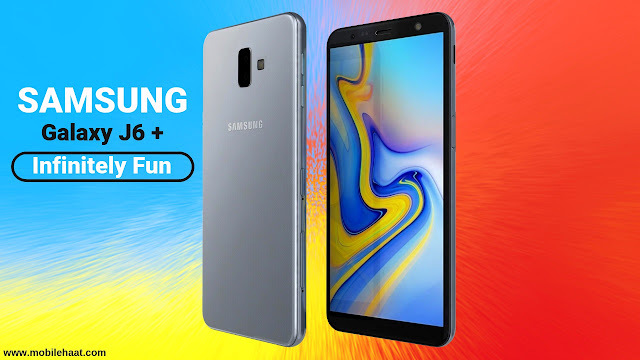 The Samsung Galaxy J6 Plus is a device with all the features users want in their phones. These cameras can click on very realistic photos in the back and front. The battery capacity on the device is large and can provide long-term backup. It has a modest display size and is suitable for any task and easy to carry. Configuration on a smartphone can be done with a lot of multitasking work, and the game can be processed with a lot of RAM. But for the price range, it goes without saying that a full HD display can be provided. This device is very promising and people can rely on it for a variety of activities. The Samsung Galaxy J6 Plus features a TFT 6-inch display with an aspect ratio of 18:5:9. It has a screen resolution of 720 x 1,480 pixels and a pixel density of 274ppi. The device provides 64GB of internal memory and 512GB of external memory, which is what users need. The Samsung Galaxy J6 Plus offers a dual rear camera with a 13MP + 5MP lens for very good quality and clarity. The front camera is equipped with an 8MP lens with a front flash that allows users to click on a dazzling selfie. It uses 4GB and 64-bit 1.4GHz quad-core processors and the Cortex A53. This setting is based on the Qualcomm Snapdragon 425 MSM8917 chipset supported by the Adreno 308 GPU. It can work together to provide users with outstanding performance. The Samsung Galaxy J6 Plus comes with a 3,300mAh lithium-ion battery that you need to charge and it will last a whole day. The device can accommodate two SIM cards that support 4G VoLTE. Other connectivity options include WiFi 802.1, Bluetooth and A-GPS with Glonass. Sensors: Fingerprint, accelerometer, proximity, light. Display Protection: 18.5:9 ration Full-View TFT Infinity Touchscreen. Colors Available: Black, Blue, Red. Camera Resolution (Back): Dual 13+5 Megapixel. Camera Factors (Back): background blur shape, 13 MP: f/1.9, autofocus 5 MP, f/2.2, depth sensor - LED flash, HDR, 28mm (wide-angle lens), live focus, panorama mode. Camera Resolution (Front): 8 Megapixel (LED flash, F/1.9 aperture). Memory Card Slot: MicroSD, up to a massive 512 GB. Battery Type & Performance: Li-ion 3300 mAh (non-removable). MP3, MP4, FM Radio & Recording, Loudspeaker.